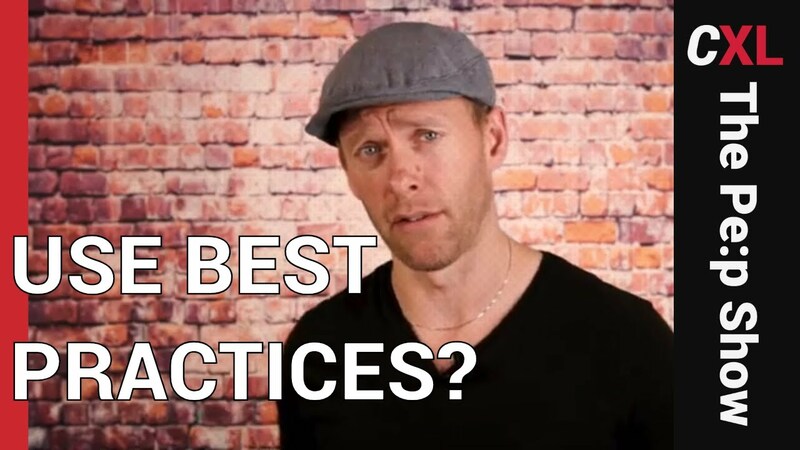 Should you follow best practices? Probably, YES! Should you follow a list of best practices when working on a conversion optimization project? Maybe. Best practices in the conversion optimization world get a bad rap, but it doesn’t mean they are wrong. In this episode, Peep discusses why following some best practices at the beginning of a project, is actually a good thing. If you don’t have enough data, best practices can at least give you somewhere to start. Should you use best practices to optimize your website? There is a best practice for everything really. There is a best practice for homepage there's a best practice for designing a checkout page e-commerce product page you know SaaS pricing page you name it. Actually there are five best practices for every type of page out there. If you google enough. So should you use them? The answer is probably yes. The thing is that best practices is your first hypothesis. You're building your new pricing page and you don't know what you know. You have no data of your own. You start with following the best practice you'll like your competitor is your first prototype so to speak. And the best practice is a synthesis of what has worked for a number of companies in the past. There is no guarantee that any of that stuff will work for you but it's the best chance you got to ship something that that might have a chance of working right out of the gate. Now of course best practices is not optimization in the conversion optimization world. Best practices off the laugh that are made fun of and then and for good reason often. But this practice is to have a great place so when you're building a first version of anything you're designing your first home page etc. you start with the best practice and then you optimize from there. So best practice is where you start not where you end up. Next Article Research + Experimentation = GROWTH!